Pakistan’s Strategic Plans Division (SPD) successfully test-fired an improved version of the Hatf-IX Nasr short-range ballistic missile (SRBM) on Wednesday, July 05. 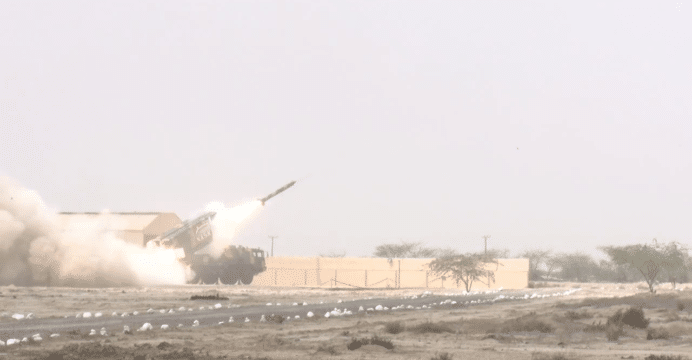 According to an official press release by Inter Services Public Relations (ISPR), the updated Nasr SRBM has a range of 70 km (the original Nasr’s range is 60 km) and flight maneuverability improvements. Footage from ISPR shows that three Nasr (v2) units were tested in succession at the target, each launched from a different firing trajectory, ostensibly to showcase the missile’s maneuvering capabilities. The Nasr is a battlefield short-range ballistic missile (BSRBM) capable of being deployed from multi-barrel missile launchers. Pakistan introduced the Nasr to compensate for its conventional deficits vis-à-vis India, most notably New Delhi’s apparent ‘Cold Start’ doctrine, which envisages the use of integrated land battle groups comprising of armour, infantry and aviation assets to quickly capture Pakistani territory. Pakistan relies on its nuclear assets to dissuade a full-scale conventional conflict with India. However, the successful execution of Cold Start, which would result in territorial loss for Pakistan before it can act upon its nuclear threat, would render the nuclear deterrence threat moot. The point of nuclear deterrence was to prevent an Indian entry, but Cold Start was imagined nullifying that threat from the onset of a conflict. In tandem with its localized availability of miniaturized warheads, Pakistan began forming the doctrine of ‘tactical nuclear weapons’ (TNW). The Nasr – along with the Babur and Ra’ad series of cruise missiles – is a TNW platform, which Pakistan believes would enable it to attack military targets, such as integrated battle groups. Pakistan imagined TNWs as a means to deter India from employing Cold Start, especially since the units directly involved in the incursion would be targeted by TNWs. However, TNWs are still nuclear weapons, and thus, remain within the domain of strategic deterrence. Pakistan has been making efforts to strengthen its conventional capabilities, which is evident in it studying wheeled self-propelled howitzers, attack helicopters and main battle tanks for procurement and improving its rocket artillery. If acquired in sufficient quantities, these systems could enable Pakistan to deter the Cold Start threat on conventional terms. However, this is conditional on continuity and growth in Pakistan’s fiscal capacity, which will remain in question for the foreseeable future. For additional reading on Pakistan’s nuclear weapons program, see Quwa’s pieces on Pakistan’s tactical nuclear weapons strategy and the state of the program since 1998.